Tripods can be bulky and awkward to use! Which is why most people don't use them. But, it doesn't have to be that way. A tripod WILL improve your pictures! We teach a lot of classes, and what we see with most people who bring a tripod, is that the tripod isn't worth using. Bad tripods are VERY common. Many camera stores will sell you an inexpensive, but worthless, tripod. Unfortunately, they're not worth the price. They are very hard to set up and use, which is why they aren't used much. The worst issue is that they don't keep your camera steady - which is one of the reasons you're using it (there are more reasons that that, though - keep reading). A good tripod properly used WILL provide you with sharper and clearer images! A good tripod can improve your image composition as well! This eTip has a lot of information in it about tripods - knowing this information will make tripods much easier to purchase and use. Sometimes, the head and legs are permanently attached to each other - this is generally a BAD idea. Most of the time, however, you purchase the head and legs separately, and sometimes, they're sold in combination with each other. The secrets of how to best use a tripod. The main purpose of a tripod is to hold your camera steady. This implies that humans are not capable of holding a camera steady (which is a very true statement!). How close you are to your subject (when shooting close-up images). The lens focal length is specified in mm (millimeters). If you have a zoom lens that goes from 18mm to 200mm, that means you can use a focal length of 18mm (wide-angle) or 200mm (telephoto), or anything in between. Longer focal lengths (e.g., 200mm) require a steadier camera in order to take a sharp picture. That's why it's difficult to take a non-blurry picture with a telephoto lens. "The slowest shutter speed you should use to hand-hold your camera is 1/(Focal Length * Crop factor)"
Thus, if you're using a 200mm lens with a full-frame sensor camera, the slowest shutter speed you should be using is 1/200 second; with an APS-C-sized sensor camera with a 1.5 crop factor (most consumer cameras), the slowest shutter speed you should use is 1/300 second. This assumes you can hold your camera VERY steady - which most of us can't! When you zoom to 100mm or longer, you have to be VERY careful to be sure your camera's exposure system chooses a shutter speed fast enough so you won't get a blurry image. Even with wide-angle lenses, you need to be extremely careful of what shutter speed is being used. If there's limited light (think sunsets), you WILL need to be using slow shutter speeds - often slow enough to easily blur your pictures. Using a tripod ENABLES you to use slow shutter speeds without worrying about blurring, thus expanding your opportunities for using longer lenses, shooting in limited light and maximizing depth of field (using smaller apertures). A good tripod simplifies your photography as you don't have to worry about slow shutter speeds and blurry pictures. 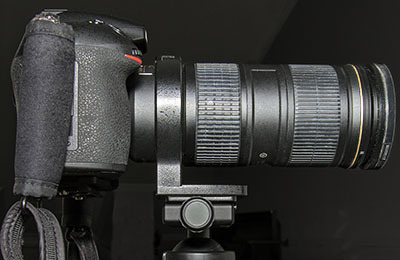 Close-up and macro images require a VERY steady camera. When shooting subjects less than a foot away, focus is extremely critical and it becomes harder to keep your camera steady enough to avoid blurring the image. A tripod can be the only way to get good macro images. A tripod slows you down - but, this is one of the most important benefits of a tripod!! Slowing down means you think more - and thinking is a required skill of good photography. Rather than just snapping the shutter, which is all-too-easy to do, you have to slow down and think about the image (see this eTip). You get to think about the composition, the lighting, the exposure, etc. Slowing down is one of the greatest advantages to using a tripod! Good photography requires you to "think" before you shoot, and a tripod is the best tool to facilitate thinking. A good tripod and head is not cheap and cheap tripods are not good. You can easily spend well over $1,000 for a good tripod and ball-head, but it's also not necessary to spend anywhere near that much, depending on your equipment. A center column allows you to easily adjust your camera up or down, but it adds instability. A tripod has 3 legs - 3 legs provide stability. Once you raise the center column, you now have a single point of axis - making your camera less stable. 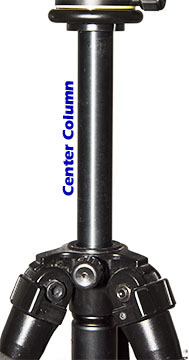 Many professional tripods do not have a center column for this reason. But, sometimes you do need a bit of extra height. Travel tripods often fold small and need a center column to achieve a bit of extra height. You're always better off NOT to use the center column - but when you need to, just be aware, that you need to be much more careful about keeping your camera steady. 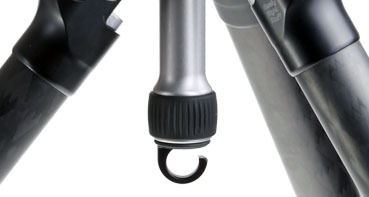 Tripods typically have legs that are in "sections". These sections allow the legs to expand, so the tripod can reach higher. The number of leg sections typically range from 3 to 5. Fewer leg sections are generally better, as each section makes the tripod less steady. But, a well-made tripod can have 4 sections without reducing stability, while poorer made tripods don't do well with 3 sections. More sections allow a tripod to fold smaller, and are great for travel. With fewer sections, tripods are less travel-friendly. This is a leg with 4 sections. When expanding a tripod, always extend the upper (larger diameter) sections first, as they provide the maximum stability. Each leg extension needs to be secured so it doesn't collapse - and this is typically done with either a clamp (image below on the left) or a knurled knob (image below on the right). Each has its advantages - clamps can be faster to adjust although they sometimes loosen up and need to be adjusted with a tool. Knurled knobs are a bit slower to tighten, but usually don't require any sort of adjustment. On most tripods (excluding some very expensive wooden studio tripods), leg braces are a "crutch". 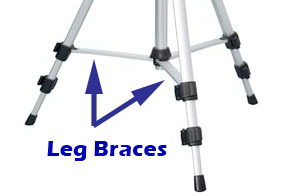 When you see a tripod with leg braces, it generally means that the tripod legs aren't stable enough to support the tripod properly. They're an attempt to stabilize an unstable tripod, but unfortunately, won't suceed. A well made tripod does not need leg braces, and leg braces only make using the tripod difficult. We don't recommend you purchase a tripod with leg braces. Tripods have 3 main attributes. They can be stable, cheap and light - but you can only choose from two of those. A stable, cheap tripod is heavy. When we talk about "light" tripods, we're generally talking about carbon-fiber tripods. These can be very pricey, but, they will NOT be more stable than the same tripod with aluminum legs - but, the tripod with the same size aluminum legs will be heavier. Carbon fiber tripods can absorb small vibrations slightly better than aluminum, but a heavier tripod will be less likely to move or tip when it's windy - and tripods have been known to topple over on a windy day (I tell you that from experience!). One thing you can do when shooting to make a light tripod heavier is to weight-it-down with something heavy - a bag of rocks or your camera bag. 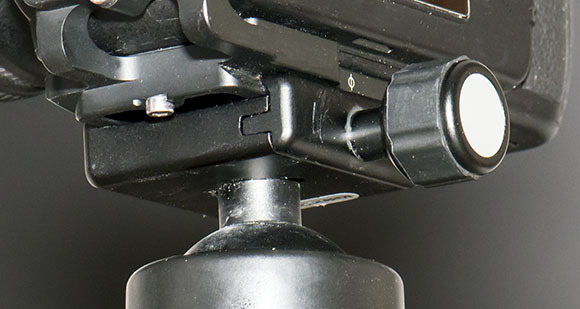 Many tripods have a hook where you can add ballast by hanging something from it. This is a convenient way to make a light tripod heavier - but, be sure the tripod is sturdy enough to handle the extra weight! Some tripods can support a heavy camera and large telephoto lens, while others can only support a small point-and-shoot camera. You need to look at the tripod and ballhead specs to see how much the tripod supports - and you should ALWAYS be conservative. You shouldn't plan on putting more than about 75% of the rated weight on the tripod, so for a tripod/head weight rating of 8 pounds, don't plan on putting more than about 6 pounds on it. Pan & Tilt heads are best for video as they allow "panning". 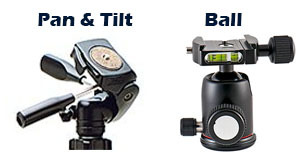 Ball heads are simpler to use than pan and tilt heads and are best for landscapes and most other kinds of still photography, with the exception of sports (monopods with one leg are often are best for sports). Pan and Tilt heads can be very cumbersome to set up as there are at least three different adjustments, which can be awkward to set up quickly. The ball head has a single adjustment that tightens the tension around the ball - loosen the adjustment and you can move the camera just about anywhere you want. Then just tighten the adjustment and you're ready to shoot. You can spend between about $100 and $700 for a ball head - the main price differential being the "brand name" and how much weight the head can support. If your camera and lens weighs under 6 pounds, you can use almost any ball heads sold. 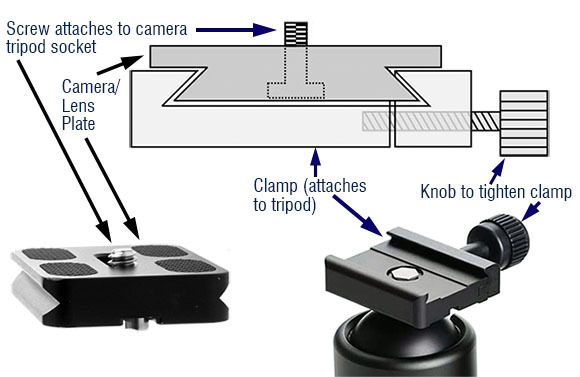 Quick Release Systems - There's one more aspect of the head - and that's how the camera mounts to the head. Some manufacturers have a "proprietary" quick-release (QR) system - stay away from these, as they are often more difficult to use and less reliable. There is an industry-standard called the "Arca Swiss" style quick release system. Any ball head you purchase should support this system. This helps assure that the QR system is stable, reliable and that you can purchase accessories from just about any source. 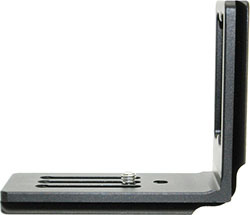 It's a very simple system where you attach a plate to a camera or lens. You can purchase custom plates designed for your specific camera, or you can purchase less expensive "universal" plates that attach to any camera or lens. The camera/lens plate then fits into a dovetail on the clamp on the ball head. Once you've set up your camera on the tripod, you want to get the tripod height right by extending the legs to an appropriate length. 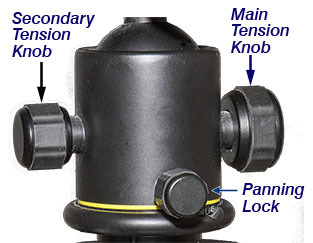 A Secondary Tension Knob (optional) - Some more expensive ball heads have a small knob that controls how loose the main tension knob is allowed to get. 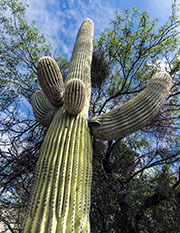 With your camera on the head, hold your camera and loosen the main and secondary knobs until the camera is very loose. Then tighten the secondary knob until the camera can still move, but has some tension. Then tighten the main tension knob. Once you set the secondary knob, you generally don't need to reset it again unless the camera becomes too loose when the main knob is loosened. We've found that this knob can be both a blessing and a curse. This extra knob can get in the way of getting your camera adjusted quickly, but, it can also help if set properly. Consider it a "nice to have", but not a requirement of a ball head. A Main Tension Knob - Use this larger knob to adjust your camera and then hand-tighten it to secure the camera in position. Panning Lock Knob - If a vertical picture is desired, loosen the main knob and position the ball head column into the slot in the ball head. Use the panning knob to adjust the camera's position. You can also purchase an "L" bracket for your camera that allows you to reposition your camera on the head either horizontally or vertically. Press Down! - A good technique to use with a tripod when taking a picture with a shutter speed faster than about 1/2 second is to press down with gentle firmness on the point directly above where the camera or lens is mounted on the head. Your hand will help absorb vibrations caused by the mirror and/or shutter. Just be sure that your hand is steady. Press the shutter with your finger - With exposure shorter than 1/2 second, since you're already pressing down on the camera with your hand, just gently press the shutter to take the picture. --or-- Use a Cable Release - Use a cable release or electronic remote device to take the picture. The Dangerous zone... - if your shutter speed is set between approximately 1/2 second and 1/20 second, the mirror and shutter vibration can cause significant blur to your image. The vibration will have little effect on shorter or longer exposures, but exposures in this range should be avoided if possible. If you need to shoot in this range, you will need to make sure that your tripod technique is perfect, otherwise blurred pictures will result. Don't raise the center column - Your tripod will be more stable if you adjust the legs to the proper length, rather than raising the center column - and always extend the upper sections first, as they're more stable than the lower sections. Hang your camera bag or other heavy object from hook (if your tripod has one) for extra stability. Assure that your tripod legs are on steady terrain. Make sure your tripod is vertical - If you're on flat terrain, make sure the tripod legs are extended equally. If on uneven ground, extend the legs to different heights to help make sure your tripod is vertical - which you can assure with the use of a bubble level (many heads have bubble levels built into them). Balance - if you are using a long lens, you will want to balance your camera and lens over the ball head. 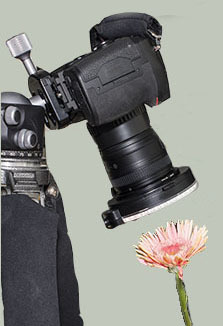 Many longer lenses come with a tripod collar which attaches to an Arca-Swiss style ball head. Just mount the lens to the ball head, instead of the camera. Sports - In sports photography, you can't always take the time to adjust a tripod - a monopod is quicker when following fast action. Very heavy lenses - Some lenses (e.g., 600mm/f4) can weigh 12 pounds - more than most tripods can support well. You often see these on the sidelines at some professional sporting events. Places that don't permit tripods - unfortunately, there are many places that don't permit the use of tripods. Some parks (e.g., Denali National Park), cities (e.g., New York City), museums and other locations don't permit the photography with a tripod unless you purchase an expensive permit. In these places, a monopod can be a good choice. When using a monopod, you should consider your legs to be the other two legs of the monopod, creating a tripod (3 legs). It won't give you the stability of a tripod, and frankly, because some really good tripods are really light and small (US customers can see them at the bottom of this eTip), I don't see much of a benefit of a monopod, except in the above situations. I consider a tripod to be a "must-have" accessory. I don't like shooting without one, but there are times when a tripod is just not practical. But, for most shooting situations, I rely on a solid tripod. Your images will be sharper and better composed. And a tripod is an absolute requirement when shooting long focal lengths (e.g., 200mm or longer), shooting in low light or when shooting macro or close-ups. You should purchase the best tripod you can afford - and when I say "best", I don't necessarily mean the most expensive. The "best" tripod is one that is very stable, easy to use and just light-enough that you won't leave it at home! If you use the Green Pod and any Arca-Swiss style brackets, this is a great accessory to own - it provides you with a quick-release when using the Green Pod.